Mr. Norton homesteaded many acres of this desert land around the turn of the century. He platted the first subdivision in Sunnyslope in 1911. It was known as the Sunny Slope Subdivision and its boundaries were from Central Avenue on the west, to Dunlap Avenue on the north and from 3rd Street on east to Alice on the south. 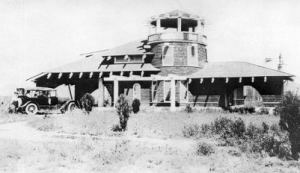 In 1919 Sunnyslope was a natural desert area with only four or five cottages on it. There were no roads, no electricity, no phones and no water—only cactus and sagebrush. Then many people from states back east were sent to Arizona for their health. With no irrigation north of the Arizona Canal, the Sunnyslope desert was a very dry area and was considered to be a good place to live for people trying to recover from tuberculosis or asthma. Many of these people built tent houses or small cottages, planning to get well and then return to their old homes. Some people, however, liked the desert and decided to stay. Marguerite and Wm. Albert Colley were among those who stayed. They had come to the desert in 1919 because of the health of their son. In 1927 the Desert Mission was established. This was a facility that provided medical, social, and religious needs of the people living in the community. Marguerite Colley, a practical nurse, and Elizabeth Beatty became known as the “Angels of the Desert” (to read more about Marguerite and Elizabeth click here). Because of their work in giving medical aid and delivering food to the needy in the neighborhood. The Desert Mission continued to provide services through many decades. In 1936 there were approximately 600 resident in Sunnyslope. There was still much vacant land, covered with vegetation and cacti. In the late 1940s, after World War II, the community really boomed. Many small businesses, churches and schools were established. The first school, Sunnyslope Elementary School, was opened in 1949, Mountain View Elementary School was opened in 1952, and the third elementary school built in Sunnyslope was Desert View which opened in 1956. Sunnyslope High School opened in 1953. Four attempts were made to incorporate Sunnyslope as a town, but each time the issue was voted down. Some residents of the area were concerned about the taxes, and others felt that the Maricopa County government, that was serving them, was doing a good job. In 1959 the City of Phoenix annexed the community of Sunnyslope along with many other valley areas. These areas became part of the City of Phoenix, but Sunnyslope has always retained its identity. John C. Lincoln Health Network has been the largest employer of the community for many years. Along with excellent health care, it also provides many other services for the schools and organizations of the area. John C. Lincoln Health Network is continuing the work that the Desert Mission provided in the early years of Sunnyslope. Through the decades, in Sunnyslope, there has been many small businesses, (mom and pop type businesses) that have served the community. Many organizations have provided guidance throughout the years in improving the neighborhood by working with the many government agencies.